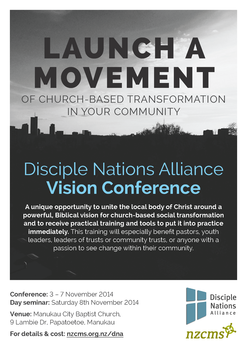 Since 1997, movements of church-based transformation have been catalyzed in more than 60 nations through the Disciple Nations Alliance Vision Conference. These events provide a unique opportunity to unite the local body of Christ around a powerful, Biblical vision for church-based social transformation and to receive practical training and tools to put it into practice immediately. This training will especially benefit pastors, youth leaders, leaders of trusts or community trusts, or anyone with a passion to see change within their community. The principles taught on this course can be applied both inside and beyond your churches. Download the programme. Dennis Tongoi will be facilitating the training sessions. He is the international director for CMS Africa and is the coordinator of Samaritan Strategy Africa, DNA’s African affiliate, which has more than 300 trainers in more than 40 countries. Dennis is a challenging thinker, a gifted teacher and a sought-after consultant for many mission organizations and schools. He has written Mixing God with Money: Strategies for Living in an Uncertain Economy and presently is pursuing a Doctorate in Theology from the University of South Africa. Dennis lives in Kenya with his wife, Irene. They have three adult children. Originally from New Zealand, Anna has worked in Asia since 1995 spending much of this time with Food for the Hungry. Together Anna and Nam started and developed the Truth-Centered Transformation programme to see if people could move out of poverty as they understood and applied a biblical worldview. This resulted with hundreds of communities escaping poverty. In 2013 they launched Reconciled World, which seeks to bring transformation by applying biblical truth to all areas of brokenness. Anna currently holds the position of Executive Director of Reconciled World, while Nam is the International Director of the Truth-Centered Transformation programme. Bring your own lunch to the conference. Bookings close Monday October 27th 2014. For bookings or enquiries please email heather@nzcms.org.nz or ph 03 3772222 ext 38. Your name, organisation and contact details (phone, email, address) are required.